You know what they say about writers: Once you turn pro, it really cuts into your reading time. Nowadays I’m not always free to settle down and give my full attention to the entire sweep of a novel. 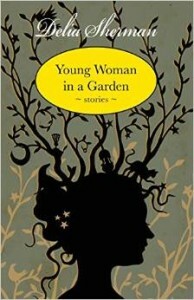 So, I like it that Young Woman in a Garden is a collection of short stories. They are bite-sized, manageable in a sitting, and a wonderful way to leave the mundane world behind in favor of a world less mundane, but — admit it — no less true. Some of these stories are familiar to me — I read them in various iterations when I was part of Delia’s writer’s group. Others, I’ve heard in part during readings she’s done at conventions. But others are completely new to me, and those are the ones about which I’m rubbing my hands together in greedy anticipation. Make no mistake about it, Delia is a true adept, a genuine master of the form. She writes with grace, and depth, with nimbleness and charm (when called for). She has a sure hand with style and language, and the breadth of her cultural and historical knowledge allows her to pull in exactly the right details to add richness and realism to her fantastic tales. If you don’t want this book for yourself, you know someone else who would love it. Yes you do; you know it. Perfect gift for that person. You can read a story from the collection , “Miss Carstairs and the Merman,” for free online.